Whoa, whoa, whoa. I was just digging in a portion of the stash (yep) and found the third ball of Kidsilk Haze that I bought for the Treeline Striped cardigan – meaning, I only actually used two skeins, not three. And now I have an extra ball (along with an extra skein of the brown W4…hmmmm). It’s like free yarn, or something! 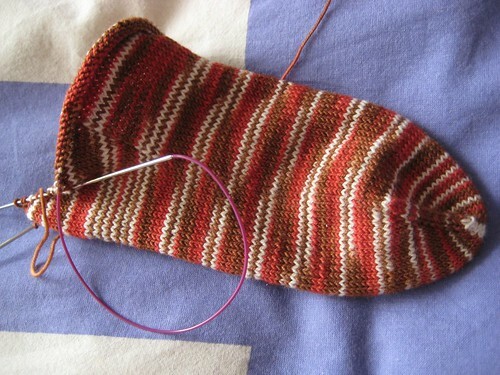 Random sock-in-progress shot. I’m working on a toe-up gusset, trying to figure it out on my own without looking at the many available patterns. Yarn is Socks that Rock lightweight in Gingerbread Dude – love it! Wow, that’s gorgeous colors ! Ahh, those colours are beautiful! 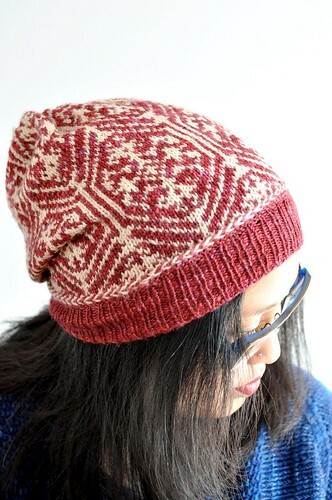 You know, that’s what I should do–work on a toe-up gusset and heel flap and figure out the math as I go along. I’ve used the various patterns out there, but I have thick ankles and am a tight knitter, which means that my socks usually end up having 80 stitches around the foot. I have yet to find a toe-up heel flap for that many stitches that looks the way I want it to and has the math done correctly. Good luck! 1 ball of KSH = 1 Ice Queen, dontcha know! I love the colours of that sock! So what are you going to make with your “free” yarn? I just wanted to thank you for your short row heel tutorial. I used it as a guideline when I was making what felt like a million zillion Christmas stocking ornaments. Hi – thanks for the tutorial on short row heels. I’m going to try that out on my 2nd pair of socks, if I ever finish this first pair! Love the stripey pattern in your latest socks – can I ask what kind of needles you’re using in that photo? Y’know, I just did the heel of a toe-up gusset (& used a Wendy Johnson pattern) and I LOVED IT!!!! As I was knitting it, I thought, this has got to be the best darn thing ever. Just catching up on some blog reading and read through some of your recent posts. I am sorry to read that you are having to endure some heartache as that is very painful. I hope you reach a time of peace. But, your hair looks great and the VBCardi is terrific. Here’s to happiness in the New Year.